With the metering systems in today’s digital cameras becoming more and more sophisticated, people often wonder if hand-held meters are necessary. This quick tutorial is designed to show why using a hand-held meter would be beneficial. Most of today’s camera meters give you three options of evaluating the scene (Matrix/Evaluative, Center-Weighted Average and Spot). Anyone who has played around with these metering types will find that even though they provide pretty good results, they can easily be fooled. The reason an in-camera meter can easily be fooled is it reads reflected light and is designed to “see” everything as a neutral gray. This works well if you have an even amount of light, dark and middle tones in the scene but not so great if there is a bias towards bright or dark tones. This is easy to overcome once you familiarize yourself with how your camera reacts in situations – but frustrating none the less. The biggest benefit of a hand-held meter is the ability to read incident light. What this means is the meter reads the light falling on the subject instead of what is reflecting back to the camera. This means you’ll get the same reading regardless of what color or range of tones the scene contains. Sometimes you can’t walk over to your subject for an incident reading so most hand-held meters also allow you to read reflected light as well, including spot metering. Some of the more sophisticated meters will allow you to take multiple readings and average those values, which is great for complex scenes. Below is a perfect example of the benefit of a hand-held meter. This scene was shot with two 100w modeling lights, both placed 45 degrees from the subject, bounced into umbrellas. The first image was shot with the Matrix Metering function, the second with the Sekonic L-358 Light Meter. You’ll notice there’s about a two-stop difference between the scenes! The problem here is the reflected meter sees our white background as a middle gray. The result is an under-exposed picture. The opposite would have happened if we had shot the same subject on a black background: an over-exposed picture. 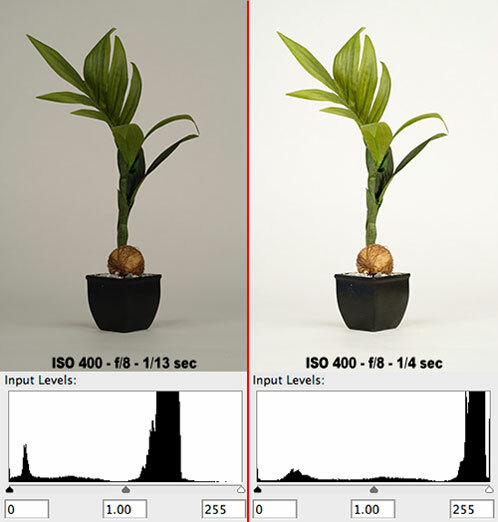 Since the hand-held meter is measuring the light falling on the subject, it ignores the tone of the background. If a light-meter isn’t in your budget, a cheap alternative would be a gray card. Since your subject meters off of a neutral gray, you would place the gray card in front of your subject, fill the scene with the card, then take your reading. This should result in a neutral reading with your highlights and shadows falling where they should be. Hopefully this gives you an idea of the benefits of both types of metering. Good luck shooting!